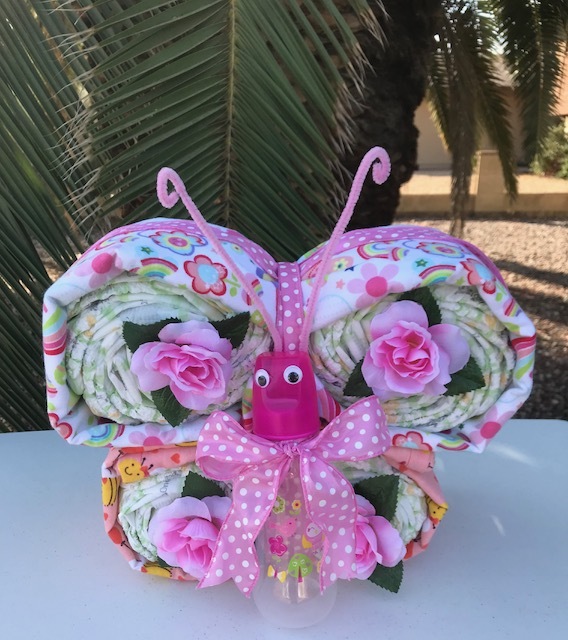 The butterfly is made with 2 soft handmade flannel blankets 35" x 41", 32 Size 2 diapers (14 - 18 lbs. with a wetness indicator), 1 hair bow, and a BPA free baby bottle. It can be made for a boy and generic too! Everything is new but taken out of original packaging. Patterns of materials will vary due to availability. Selection is Designer's Choice. Customization is an additional charge. Shipping is $35 and up (depending on the zip code where it is being mailed to, weight and mailing box size) not $7.50 as shown in cart. This is also available for local pickup in Phoenix, Arizona. Cute and practical!